Flavor Flav is a man with a multitude of talents. He may not look it, but he’s actually a multi-instrumentalist, as well as a reality television star and Grammy-winning rapper alongside Chuck D in the seminal rap group Public Enemy. Also, apparently, Flavor Flav is a chicken genius and budding restaurateur. Flavor Flav is opening up a fried chicken restaurant in Clinton, Iowa, and maintains that he’ll be in his chicken shack working when he’s not on tour or otherwise engaged. And thus, Flavor Flav Chicken was born in the small town of Clinton, Iowa. The idea germinated when Nick’s brother, Las Vegas restauranteur Peter Cimino, had Flav fry up some chicken wing at Cimino’s Las Vegas restaurant, Mama Cimino’s Pizza. Cue the new business venture. I mean, if Jay Z can do it, why not Flavor Flav? 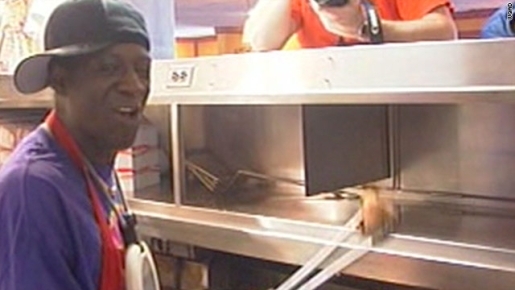 Flavor Flav actually has a cooking background. His family owned a diner in his native New York and he attended cooking school in the 1970’s before striking it rich as half of Public Enemy.